Vessel motion will often cause the pulmonary arteries to appear less dense. If the vessels on adjacent images appear normal, and the lung windows reveal respiratory motion in the slice in question, it is almost certainly a respiratory artifact. 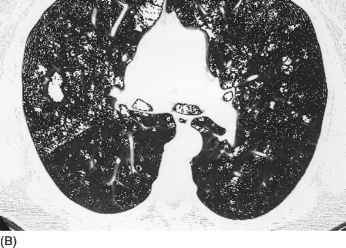 As a general strategy, pulmonary embolus should be visible on two or more images for confident diagnosis. Linear artifacts arising from high-density structures, such as the contrast-enhanced superior vena cava, calcified lymph nodes, or surgical clips, can cause apparent lucencies in a contrast-enhanced pulmonary artery. The artifact source is usually readily apparent and the defect is linear in the axial plane. Figure 7 Multiplanar reformation. (A) Helical CT angiogram at mediastinal window shows a questionable filling defect at the bifurcation of the superior subsegmental artery of the right lower lobe (arrow). A small embolus is also seen in the anterior subsegmen-tal artery of right upper lobe. There are small bilateral pleural effusions and surgical clips in the left hilum. (B) Sagittal oblique reformation at mediastinal window better depicts intraluminal clot in the superior segmental artery (arrow). Figure 8 Multiplanar reformation. 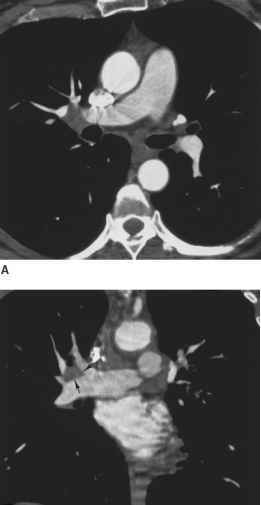 (A) Helical CT angiogram at mediastinal window demonstrates, at the level of right hilum, hypodensity lateral to right pulmonary artery that could correspond to lymphadenopathy or thrombus. (B) Coronal oblique reformation at mediastinal window shows perivascular nature of hypodensity between right superior pulmonary artery and descending pulmonary artery due to lymph nodes (arrows). Small nonocclusive clots may not be visible in densely enhanced larger pulmonary arteries. After routine reading on soft tissue windows, one should reread the images of the proximal arteries at a wider window and higher level. A window width and level of 700/100 HU is applicable to most patients (Fig. 9). Caution should be used in altering window and level because this accentuates artifacts such as inhomogeneous contrast mixing. In general the margins of flow defects are less distinct than the margins of a PE.